To make the Thumbprint Sun: paint or color a yellow circle at the top of the page. Using the index finger, make yellow oval shapes to form the sun’s rays. To make the Thumbprint Flowers: Use pinky for the circle in the middle & index fingers (oval presses) for the petals and leaves. Paint a green stem. 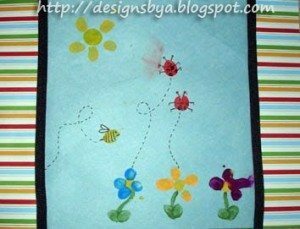 Use a red thumbprint for the thumbrint ladybug and a yellow thumbprint for the thumbprint bee. Draw in details when dry. Cool! I think this will be perfect for my kindergarten class!